What am I doing this April? Besides turning 32, (Le sigh), I’m trying quite a few things. 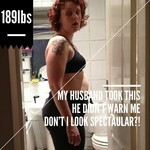 I’m in love with Instagram this month & have been joining in with a daily photo challenge that’s all fitness inspired. My favorite photo so far is the progress shot my husband took. I suppose it was my own fault for asking him to take a photo during the F1 qualifying. But he could have warned me, my face looks like I’m in a gurning championship. At least it will be a great photo to compare an after shot to. Anything will look better than this! I’m also doing a squat challenge, every day I do more & more squats. I think the month started with 30 squats, and 10 have been added every day, with Sundays off, I’m 40 squats through the 100 I have to do today. I’ve found it easier if I spread them out across the day, but on the one day where I did do them all in the evening, it wasn’t too crippling & didn’t take too long. I’m not looking forwards to the 200+ towards the end of the month. But I wasn’t in love with the idea of doing more than 10 squats in one day at the start of the month. I’m also running! I’ve downloaded Runkeeper (hasn’t it gotten snazzy since ast year?) and I’m going to run the Preston 10k in September. It’s £12 compared to the £30, or so, for the Mancherster 10k the entrance fee alone says I should do it! It’s a happy coincidence that there are 25 weeks until the 10k. That’s enough time to do both Runkeeper’s C25k and 10k training plans. My 1st official training run is on 14th and what’s cooler is that my friend Maz wants to join me (well, that’s a stretch, a week or 2 she asked if she could try running with me & now I’ve told her we’re going to run 10k in 6 months time.) It’ll be interesting trying to fit in running, we both have jobs, we both have 2 kids & other halves who also work. So that 25th hour every day, and 8th day a week will come in useful! I’m also going to give a new class a try, I love the Box Fit class I go to, but a fitness friend recommended a MetaFit class on Saturday mornings. The Metafit™ bodyweight training system is an effective and simple tool for fitness professionals looking for the most effective group workout that gets big results and increases your revenue. To burn fat you need to change the resting metabolism, work big muscle groups with high intensity intervals and get quick results for your clients. The Metafit workout can be taught as a studio class, small group or as a one to one/personal training session. Or so says their website. It sounds like a body weight version of Cross fit to me. I guess I’ll let you know on Saturday evening. So anyone have any big plans for April?